Recently DD and I decided to go out and participate in a make-n-take card event. When we got to the store we saw the card that we were to make. We were to use Lawn Fawn products for our card. I love the Lawn Fawn stamps and dies but I wasn't so sure about the adhesive and paper products. They were not premium quality that I was used to. I made my layout a bit different than the sample. I brought the card home and changed out the cardstocks for my heavyweight ones and I also added the pink patterned paper. 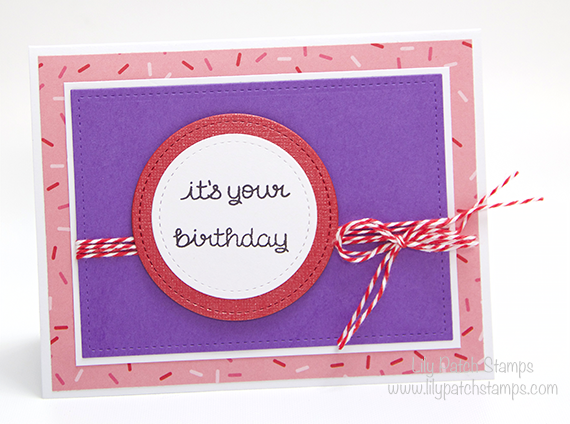 On this card, I used Lawn Fawn dies to cut out the purple, red and white cardstock. I stamped the sentiment using a black Lawn Fawn dye ink. I wrapped the twine around four times then tied it into a bow. The circles are popped up using dimensional pop dots. 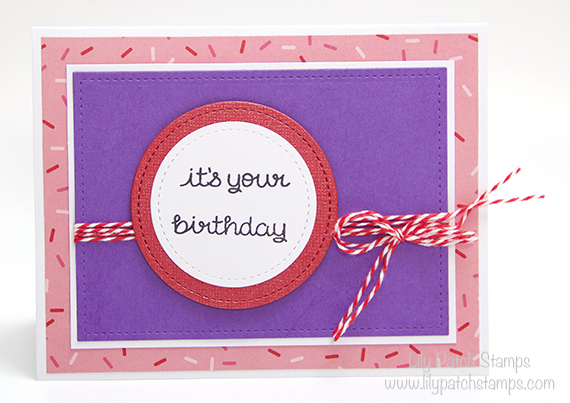 This card is true celebration with its vivid colors! Absolute fun! Thanks for sharing with us at TTCRD. Great CAS card! Thanks for joining us at Crafty Gals Corner! Fun birthday card! Love the colors! What a fabulous project, Kim! You sure picked the right colours. Thanks for joining us at ATSM.